When I received an email this past spring from a parent at my child’s school asking parents to sign a pledge to not give their child a smartphone until the 8th grade, I signed it immediately. I was so relieved that someone actually was doing something. I had witnessed the negative impact of smartphones in my older son’s grade and was overwhelmed by the way this small device was fundamentally changing childhood for children. The email was compelling, and explained the unrealistic social pressure to have a smartphone despite it being an immense distraction and potentially dangerous with exposure to sexting, cyber-bullying and sexual predators. Also, the email explained how childhood is changing for children. Playing outdoors, spending time with friends, reading books and hanging out with family is happening a lot less to make room for hours of snap chatting, instagramming, and catching up on You Tube. This parent was speaking my language, and I wanted to be part of the movement. Within a few days, I joined the Wait Until 8th pledge as a voice and started encouraging my friends to sign. News about the pledge spread quickly and one month later parents from 40 more schools and 14 states had signed the pledge. Fast forward nine months later, and now more than 6,400 parents from all 50 states are delaying the smartphone for their child until at least 8th grade. While many parents are saying yes to waiting on the smartphone, some moms and dads have some reservations about holding out on this technology for their children. They ask, “shouldn’t children become experts in using a smartphone, since technology is here to stay?” Smartphones are arguably more easily navigable than a television, microwave oven, or a laundry machine. Learning how to use one takes very little practice. Remember? We all figured it out just fine back in the late 2000s. If a child never used a smartphone until they were 14 years old it would probably take them a day or two to master the device. Others worry children will miss out socially, or won’t fit in. Maybe, but what’s the point if they end up lonelier and discontent? Research shows the more time children spend on social media the less happy they feel in all aspects of their life. Also, overuse of social media is linked to unhappiness, loneliness, depression, and even suicide. Children can use the time not on a smartphone to make more meaningful relationships. Some parents protest children won’t be as safe without a smartphone. Worry instead that it will probably get broken, lost, or stolen before it keeps them safe. Know that the time spent teaching your child rural, suburban, or city survival skills without a smartphone will likely be more valuable than a smartphone will ever be. If your child needs to reach you, and you would feel safer if you could reach them, buy a basic phone or a two-way calling watch instead of a smartphone. All of the major carriers still make a basic phone that just calls and texts. This avoids many of the dangers and distractions of the smartphone. You can still sign the Wait Until 8th pledge if you go this route. Other parents think children are doing educational games and so somehow they’re getting smarter using their smartphone? Not only does a regular pencil and workbook do the job just as well, but you also don’t then have to worry about the tangential distractions the smartphone so famously provides. Children will have plenty of time to use a smartphone as an adult. Childhood is the only time they are truly free to discover themselves without the valuable tool yet inevitable distraction that is the smartphone. Think of how many hours they could be spending developing social, interpersonal, teamwork, survival, and problem solving skills. If you’re still wary, try one screen-free weekend with your child and let your family feel the difference. Erin Breitenbach lives in Austin with her two sons and is a voice for the Wait Until 8th pledge. She has a PhD in Health Education from The University of Texas and works as an Associate Professor and Department Chair for a Doctorate in Health Education program and a Doctorate in Education in Health Professions Education program. 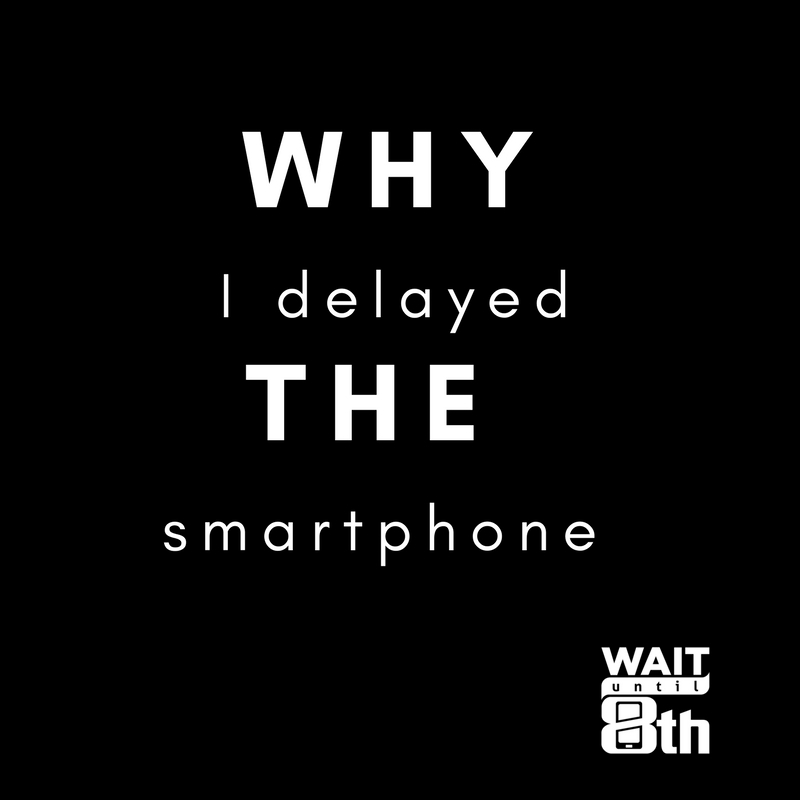 Please consider delaying the smartphone for your child with the Wait Until 8th pledge. There are so many reasons to wait. Currently the average age a child receives a smartphone is 10 years old despite the many distractions and dangers that comes with this technology. Join more than 16,000 parents by signing the pledge today. Never miss a Wait Until 8th blog. Sign up today.